Vladimir was born in 1970 in Ukraine in Nikolaev. Vladimir graduated four years at Odessa Art College (OTHTU) in Ukraina. As a child he became interested in art. Mostly he was interested in small sculptures. After college, he started working at Odessa Film Studio, where he began to make his first author knives. For a long time he was living in Estonia in Tartu and worked as an artist in "Kodukiri" magazine and as a sculptor in "Ethnographic Museum of Tartu". Then he lived in Haifa (Israel) and worked as a property master at "Municipal Theater of Haifa". Today Vladimir is living and working in Monza (Italy) in his own art-studio "Studio Burkovski SNC". His studio is working on completely author works and also make collaboration works with Italian makers and with best makers all over the world. 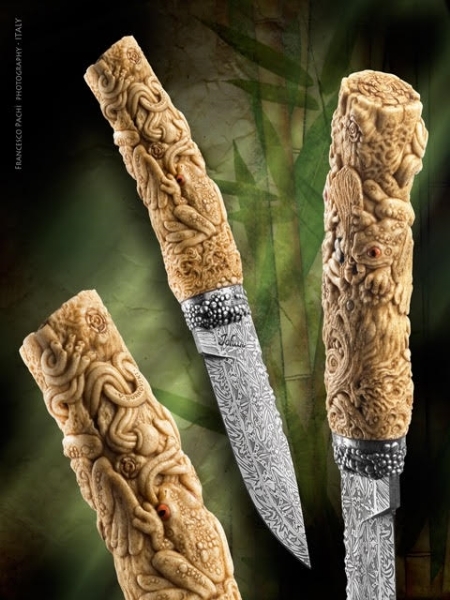 Combining the sculptural technique of carving with the engraving of the best engravers, and with forged Damascus from Italy, USA, Sweden, and France allows to Vladimir to create unique works according to his customer's orders. 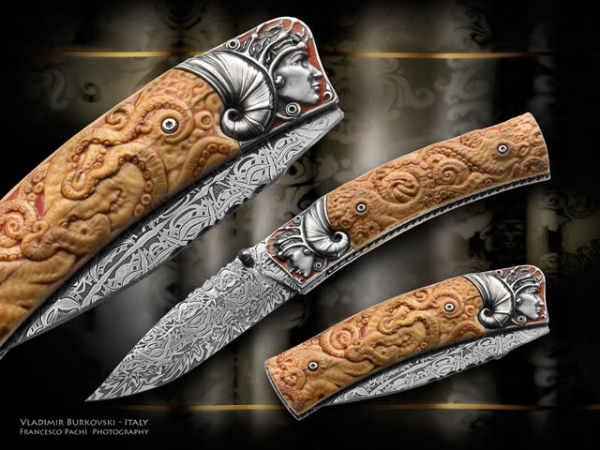 Inspired by the works of other artists and by the traditions of world of art Vladimir creates aesthetic and functional one of a kind knives. His knives continue to perform their main function, but at the same time they becomes work of art. He is participating at International custom knife show in Europe and USA where you can see his works.